Hundreds of people remain stranded at a key border crossing between Afghanistan and Pakistan after Islamabad imposed stringent new border controls. Afghans now need valid passports and visas to enter Pakistan but many at the Torkham crossing were unaware of the changes that came into force on 1 June. Some 10,000-15,000 people use the crossing near the Khyber Pass each day. Pakistan says the new rules will soon apply at other crossing points too, and aim to limit the movement of militants. The restrictions are likely to affect an estimated one million Afghan refugees in Pakistan. The long and porous border is a notorious source of tension between the two countries. Pakistani journalists who visited Torkham after the measures came into effect say many people had not heard of the new rules. Other travellers had heard but hoped officials would take pity on them and let them pass. Most have large families on both sides and travel back and forth. They are also mostly poor and uneducated. One man of about 70 said he faced "no problems at all", but Sharifullah, who was travelling to Afghanistan with his wife, had a different story. "I don't know how we'll come back. I have a passport but my wife doesn't," he told local journalist Ibrahim Shinwari. "And we'll need visas. We have to come back - half our family is in Peshawar." 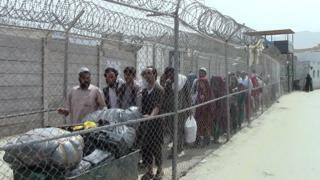 According to another man, Abdul Wahid, who had come from Afghanistan, there were crowds on that side of the border too. Across the fence, a woman and her daughter were weeping as they could not reach a sick relative in hospital in Peshawar. They did not know the crossing had been closed. But a couple of groups of men could be seen carrying coffins of dead relatives to the Afghan side. At the moment, only Pakistani officials are checking travel documents. For Afghan border guards, it is business as usual. What measures have been introduced? Pakistan has set up walk-through gates and scanning machines to check travellers and their luggage, but their passports and visas are checked manually by border guards. Pakistan says the system will be extended to seven main crossings along the tribal region, and the remaining ones in Balochistan province, depending on the availability of funds. Afghan refugees living in Pakistan have used the crossing to shuttle back and forth for nearly 40 years without being asked questions. They will now be required to produce a Pakistani visa if they want to enter Pakistan. Pakistan says it wants to discourage militants crossing into Pakistan to carry out attacks. Islamabad has been pushing for greater border controls since the Army Public School attack in 2014, and especially after the assault on Bacha Khan University (BKU) near Charsadda in January this year. In support of their move, they quote intelligence reports that two of the BKU attackers travelled into Pakistan through Torkham. Islamabad has accused Kabul of not doing enough to demobilise members of the Pakistani Taliban who crossed over to the Afghan side and now mount attacks on Pakistan from there. But many believe the border closure move is more political than having anything to do with militants, as the long border is criss-crossed by hundreds of smugglers' routes from north to south. They say one reason could be Pakistan's attempt to create problems for Kabul amid rising tension between the two countries since moves to restart peace talks with the Taliban broke down. Another reason may be Pakistan's eagerness to legitimise a frontier, which Kabul is not ready to accept as an international border. Pakistan has said that it will replicate the Torkham model on seven main crossings along its Federally Administered Tribal Areas region, and the remaining ones in Balochistan once more funds become available. Afghan sources say Pakistani restrictions at Torkham are a "unilateral" move. Up to 2014 Pakistani, Afghan and Nato forces ran co-ordination centres at Torkham and Chaman. These centres became defunct when Nato scaled back its presence.